Went for a walk down by the local pond today. 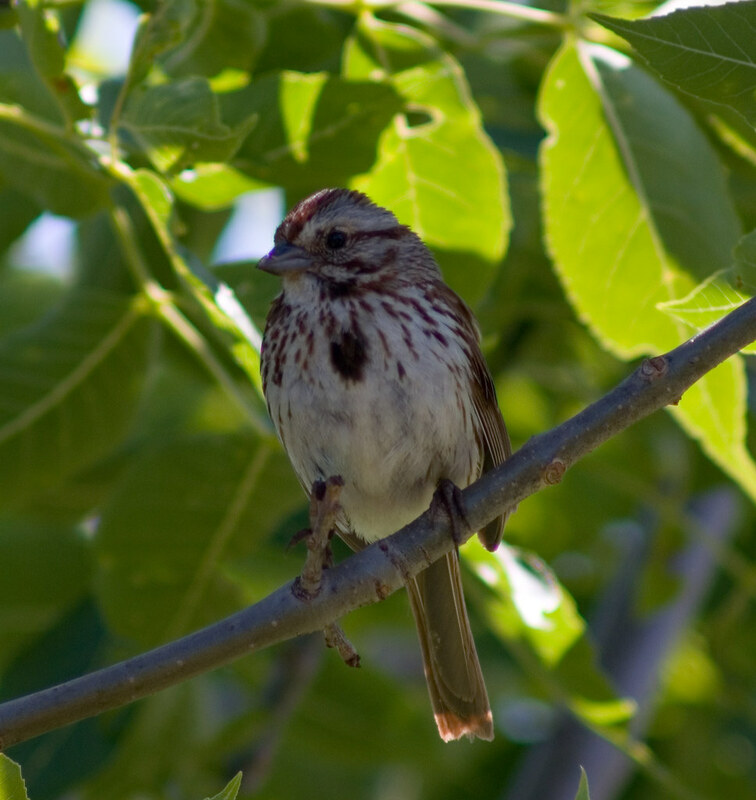 This House Finch (I think) posed for a few. Wow, very detailed close-ups. 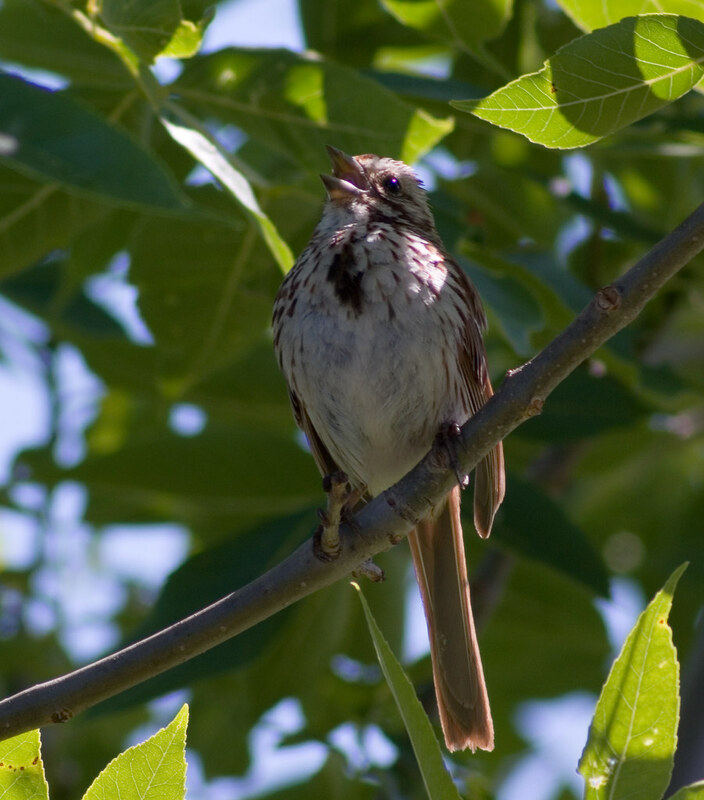 I really love bird images were the bird is predominant in the frame---not a tiny blurry spec behind a ton of branches. P.S. 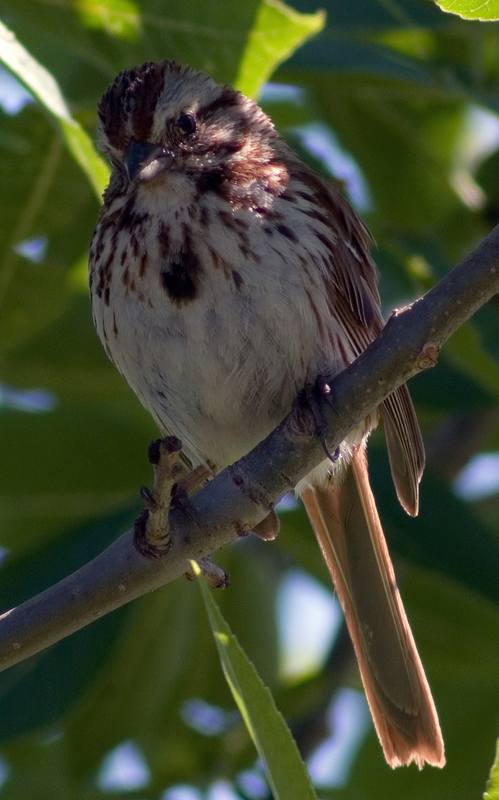 It's a Song Sparrow (Melospiza melodia). 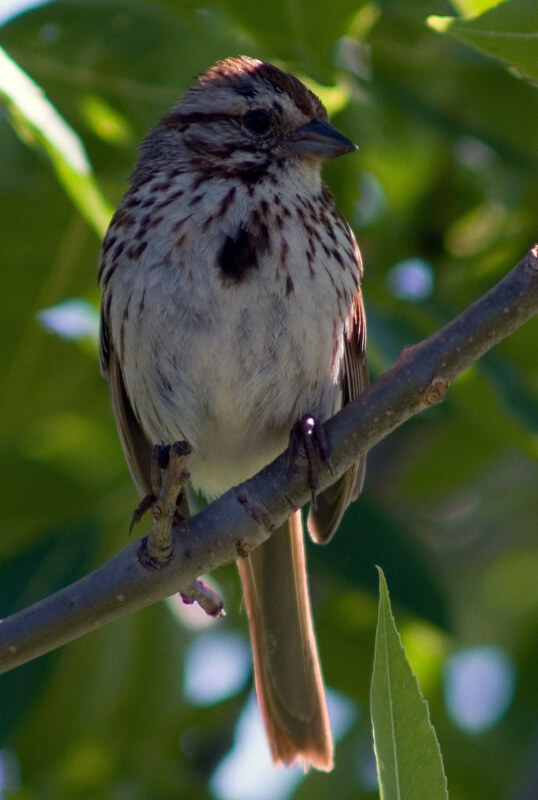 Male house finch has a red chest, and the female very thin stripes. Also the voice is different. Tom, nice series - that first one has some wonderful potential! With your permission, may I try tweaking the exposure a bit to bring out the levels and brighten the shadows a tad for that first image? No guarantees of course. Go for it Marc. I've much to learn about PP. What camera and ISO settings? I might try to smooth out the background noise a tad, but there's always some risk of NR smoothing out details. Pentax K10 and ISO 100. Guessing f8? Here is a quick adjustment of levels, exposure and a tweak with shadow/highlight. Ran a pass in NN. I didn't use any camera profile since I couldn't wait any longer and must head to bed. 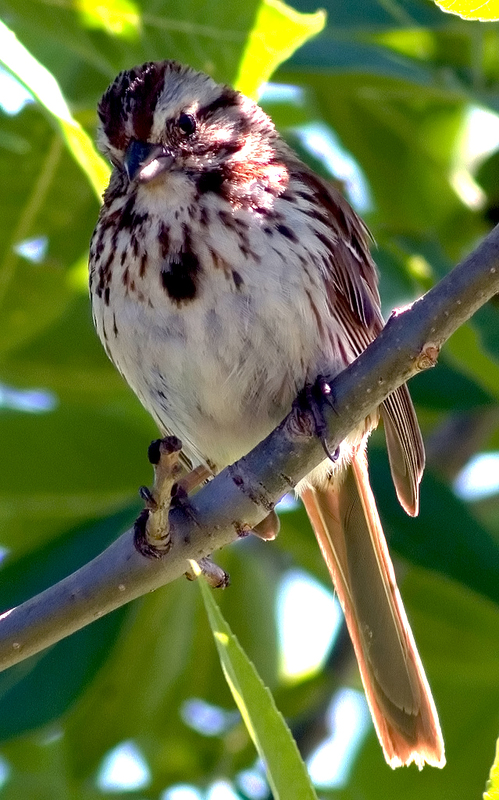 Disclaimer: I really didn't take my time looking and trying to balance the hot spots of sunlight on it's head, etc. Again, forgive my haste in doing this correction - I am sure I could do better for you with more time. Hope that helps Tom? Thanks for taking the time with this. That certainly brings out the detail that was missing in the earlier image. My learning curve continues. I really need to learn more about PP. I use Photoshop Elements and I'm not sure NN and Camera Profile are phrases I've ever encountered with that product. They might be there but I'm not aware of them. I seldom do more than adjust contrast and sharpen things a bit. Beyond that my knowledge hits the wall. Perhaps I take a course in the fall or change software. My honor Tom to help out. PE (Photoshop Elements) has a lot of the functions found in Photoshop, it's just not as powerful a bow or as many arrows in the quiver as Photoshop. Please confirm that you have an adjustment function for Levels? I believe in the menu it's under "Enhance...". I can try diving into the specifics of the tweaks I did, but of course it was a rushed job so I could head to bed... These will be some of the things I will cover as an overview in my workshops. Not everyone has a Better Beamer setup, etc. so you must sometimes overcome the exposure difficulty in software. NN = Noise Ninja, a software based noise reduction program. It can be had as a standalone application or a Photoshop plugin. The camera profile references custom noise level measurement, based on model/manufacturer and ISO level used. I also use Dfine and there is also Noiseware and NeatImage as two other options. Perhaps I'll try to document some articles for Pentax Forums in the future. IMHO, there is nothing wrong with correcting exposure in PP. I am reluctant to consider changing saturation, etc. values since Pentax image color capture is already so good that those are not normally needed.